This is for general information to all the candidates who applied for the posts of Grade - Ill (Junior Assistant / Account Assistant, Dresser, Pharmacist, Pharmacist (Ayur), Radiographer, Laboratory Technician) against this office Advertisement No. Janasanyog/D/ 10846/17, dated-16.12.2017 and Janasanyog/D/ 14145/17, dated Guwahati the - 06.03.2018, that the written examination for the above posts are scheduled to be held on 8th July' 2018 in two different sessions. 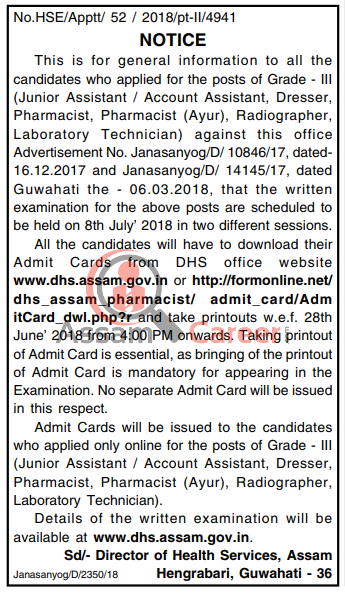 All the candidates will have to download their Admit Cards from DHS office website www.dhs.assam.gov.in or http://formonline.net/dhs_assam_pharmacist/admit_card/AdmitCard_dwl.php?r and take printouts w.e.f. 28th June' 2018 from 4:00 PM onwards. Taking printout of Admit Card is essential, as bringing of the printout of Admit Card is mandatory for appearing in the Examination. No separate Admit Card will be issued in this respect. Admit Cards will be issued to the candidates who applied only online for the posts of Grade - Ill (Junior Assistant / Account Assistant, Dresser, Pharmacist, Pharmacist (Ayur), Radiographer, Laboratory Technician). Details of the written examination will be available at www.dhs.assam.gov.in.